Having a son or daughter go off to university for the first time can seem daunting. It’s a whole new stage in their lives, and you want to help in any way you can. It’s often difficult to sit back and look on as your child grapples with decision-making and learns to balance priorities alone: Should I work on a student event or study for my midterm? Should I attend class or play a video game? We’ve put this information together in the hope that it will help you navigate this uncharted territory to become the effective sideline student coach you want to be as you watch your son or daughter blossom. And of course, we’re always here to answer any questions you might have. Come for a visit: Some factors, such as sense of community, are better seen or felt in person. At SJU, you can book a visit any time, but major visit days in the fall, in March, and in May offer special additional features. Application deadlines: All full-time applications are handled through the Ontario Universities’ Application Centre (OUAC), whose website lists application deadlines. We encourage Ontario secondary school students to apply before the December break. Although students from outside Ontario can apply a little later, we suggest that they also apply as early as possible. Acknowledgment of an application: Shortly after applying, your son or daughter will receive an application acknowledgment email that explains the next steps for students who have applied. Admission Information Form: An important step is the completion of an Admission Information Form (AIF), which should be submitted within two weeks of applying. Sometimes these forms can make a slight difference in successful admission. Offers of admission: The date students will receive an offer of admission depends on the program selected, their academic average, and any special entrance requirements such as the AIF. We want to have enough information to compare all applicants fairly, and we want students to succeed in their studies, so we may wait for completed forms and/or updated grades before making an admission decision. Timing of offers of admission: As enough information is collected, notifications of acceptance are sent on a continuing basis beginning in December. Only a small number of students (less than 10%) typically receive an offer of admission in December or January. Other small batches are made in February and March. More than half of our offers are sent at the end of April or in early May. Entrance Bursary deadline: Please note that the University of Waterloo Entrance Bursary deadline usually falls in April – before many of our offers are made. We recommend that students apply regardless of whether or not they have received an offer yet. Final date for Offers of Admission: Each year, Ontario universities agree on a final date in May by which all offers of admission must be made. Students then have until a subsequent date, usually several days later, to respond. All offers are conditional on the student achieving satisfactory final marks. You’ll find this year’s dates posted on the Waterloo website for future students. Residence application deadline: For students intending to live on campus, Residence ranking forms and a $500 deposit are also due by the residence application deadline. Early offers of admission: If your son or daughter has already received an early offer of admission, congratulations are in order! We will send complete course selection details in May and June, so please be patient. Congratulations, your son or daughter has been admitted to St. Jerome’s University! If you’re wondering what happens next, a good starting point is our checklist for students who have been admitted. Once students accept their offer of admission, there will be a whole new set of details to address. The coming months will involve many new experiences: learning to select courses; navigating degree requirements; and, if students are not living at home, taking care of needs such as laundry and groceries and finding out how live with a roommate. This is a period of transition and stress, both good stress and the overwhelming kind. How can you best support your child during this time? As an involved parent whose goal is to help your child prepare for what’s ahead, you’ll want to explore the list of resources for parents prepared by Waterloo’s Student Success Office and also take a look at the programs and assistance available from SJU’s Student Success Services to learn how your student will be supported during the transition to SJU and Waterloo. You can learn how to be a coach for your student, thereby allowing personal development and growth. According to Arthur Chickering, a student development researcher, university is a time when students can gain autonomy, establish identity, and learn to manage relationships. If you’re dealing with a stressed son or daughter during the term, remember that the feeling of being overwhelmed is actually a common experience for first-year students. They might discover new hurdles such as learning how to study or manage time because courses could require them to read multiple chapters for just one subject each week. Midterms and exams: For many students, getting past their first round of midterms in October gives them the confidence to know they can handle university. The greatest anxiety is often related to getting to that first point, which means that you can expect your son’s or daughter’s stress levels to increase around mid-October. Another time when the pressure is commonly high is the end of term. You’ll be able to find out when to expect these times by checking the timelines information below. Academic stress: Students are generally expected to achieve a 65% average in first year in order to continue at university. They are often surprised to find that their average may drop 10%-15% compared to what they were used to achieving in high school. A variety of on-campus resources are available to help a student who is having academic difficulty. Check the list below so that you can encourage your child to reach out to these resources. Homesickness: Some students who are living away from home experience homesickness early in the term. They suddenly realize how important their family is! Waterloo’s Health Services department has good information about coping with these feelings that you can share with your son or daughter. “Ask good questions: Instead of trying to fix the problem, ask about a plan to handle it.” You can ask whether your child has spoken with a student advisor (if it’s an academic issue), or with a Don (if it’s a residence issue). “Be an effective listener.” Listening without judging is hard but is a sign of caring. Often your son or daughter may simply need to vent and let off steam. Your student’s Academic Advisor: Until they declare a major, all first-year students are assigned a first-year academic advisor who knows about campus resources and regulations. Advisors help students select majors and courses and navigate degree requirements, and they can refer students to clubs or activities they might enjoy and that would complement their studies. Encourage your student to meet with an advisor, ideally at least once a term during the first year. A Family Guide to Academic Advising describes the advisor/student relationship as two-sided because it is up to the student to apply the information provided by the advisor. Remember that students who seek out these resources on their own will be more likely to use them. One way to help is to discuss together before the appointment what questions to ask the advisor. This strategy provides a good opportunity for successful meetings with the advisor and helps students start taking charge of their academic future. Help in residence: If the difficulties are related to living in an on-campus residence, the first person students should talk to is their Don. Dons are upper-year students trained to help solve problems and to support the students on their floor. The Waterloo Residences department also offers tips for parents that you might find useful. Professor/teaching assistant: If your son or daughter is struggling in a class, encourage a conversation with the professor, or if the class is large, with a teaching assistant (TA) who helps the professor. TAs are often more accessible, and they usually mark essays or exams, so they may be able to explain where to improve. All of your child’s professors have office hours, which is the best time to reach them outside of class. Office hours are provided in the course syllabus given to the class during the first week of lectures. It’s important for students to visit a professor or TA early in the term to ask questions rather than wait until the end of the term to admit they do not understand. Health Services: A major worry for every parent is a child who is sick and away from home. Your child can contact Health Services (next door to SJU) to book an appointment with the daytime student medical clinic, which takes walk-ins for urgent medical problems. Health Services also posts a list of after-hours clinics. A full-time student is covered by the student health plan. There is also a student health pharmacy in the Student Life Centre on the main campus. Quest and email: Many important notices and reminders are sent to students at the email address they have recorded in Quest, the Waterloo student information system. Upcoming deadlines and other details are also posted on Quest. Encourage your student to make sure the email address is correct, to check Quest regularly, and to read any email messages from SJU or Waterloo. LEARN: LEARN is the name of the software that most Waterloo professors use to run their courses. Students must have paid their tuition and fees in full or have arranged for them to be paid in order to access LEARN and, therefore, their courses. The Faculty of Arts also posts need-to-know information for first-year students on LEARN, such as reminders about winter course registration start dates or when fees are due. It is a good idea to remind your son or daughter to check LEARN regularly. Selecting a Major: Many parents are anxious about their student’s selection of a major. Faculty of Arts students are technically not in a major in first year but declare their major at the end of the winter term. SJU and Waterloo review the process of selecting a major with students in February and March during the winter term of their first year. We host numerous information sessions about this topic around this time so that your student can receive plenty of relevant information. You can encourage attendance at these sessions. Timelines: The academic calendar is a student’s contract with the University. It also lists key dates such as final exam periods, study days, and Reading Week (the week in February students have off to read and prepare for midterms). Deadlines for paying tuition and fees and for dropping courses without academic penalty appear here as well. Your student is expected to know what these deadlines are, so you can encourage careful checking of the listings. Both SJU and Waterloo are bound by government privacy legislation that limits what we can communicate to you as the parent. Unless we have received informed consent from your child, the University can give you only general information – no specifics. Therefore, if you would like to know what time your son or daughter is in class or what grades have been achieved, you’ll need to find out this information from your child directly. Your son or daughter will thus have the opportunity to talk to you about matters such as progress in a class or reasons for changing a major. In this way, your child can develop independence and enhance communication skills. AccessAbility Services – If your son or daughter has had an Individual Education Plan in high school, registration with AccessAbility Services is very important. They can arrange appropriate accommodation measures without compromising the academic integrity of the curriculum, so that everyone meets on a level playing field. It’s a good idea for your child to get started by registering with them over the summer before school begins or immediately at the beginning of term at the very latest. Co-operative Education – If your son or daughter is in a co-op program, resources are available to help facilitate the co-op process and ensure a successful work term experience. Centre for Career Action – Students can make appointments for job search and career-planning help. Regular group workshops are offered on topics such as Career Exploration and Decision Making, Résumé Tips, and Further Education Boot Camp. It’s smart for your child to start thinking about summer jobs in December or early January; the Centre maintains a listing of summer job employment programs. Counselling Services – Occasionally students need help coping with unexpected difficulties – the sudden death of a family member, a relationship breakup, etc. Free sessions with a qualified counsellor are included in tuition fees. St. Jerome’s also has a chaplain who is trained to listen to students’ concerns. Student Success Services at SJU – Helpful and knowledgeable staff in SJU’s Student Success Services, who will know your son or daughter personally, are always available to discuss time management skills, study strategies, and degree paths. The office also runs valuable group programs and workshops. Student Success Office on main campus – The University of Waterloo Student Success Office regularly offers group workshops on note taking, term-planning strategies, and test preparation and anxiety. If you know that your son or daughter is struggling with any of these issues, you could suggest a workshop. They work closely with the Ontario Student Assistance Program (OSAP) and can assist your son or daughter with questions about OSAP. The Waterloo website displays scholarships and awards that are offered regularly. Students can keep an eye on these awards over the years and apply to the ones they qualify for. SJU and Waterloo also offer bursaries, which are funds provided to students who are in financial need; these amounts do not have to be paid back. Bursaries require an application. Students apply for a Waterloo Entrance Bursary before they arrive. After they’re at university, they can apply for an SJU bursary (Will need to link to new Financial Support page) in their upper years. We’ve been in your shoes – watching our daughter consider universities and wonder about the best choice for her academic needs. We, on the other hand, had different questions: Would she be safe? Would the university staff be accessible? Would she be just a number? All the questions you're asking now are probably very much the same. Like you, we toured the universities our daughter was interested in, and they all were very welcoming on the student tours. They all promised excellent communication, safety, and individualized attention. After applications went in, however, only St. Jerome's started to fulfil that promise. The staff reached out to our daughter, answering all of her questions. Every call, every email, and every visit demonstrated that the St. Jerome's team remembered who she was. Even people we met for the first time seemed to have had a connection with our daughter – even the Registrar knew her! When the time came and our daughter accepted her offer, she did so with great joy and excitement. But the personalized attention didn't stop there. Any question or problem between her admission and her arrival at school in September was dealt with promptly and politely. If the people we asked didn't know the answer, they found someone who did! Unlike other universities, where it seems that voicemail boxes are running the university, we were always able to speak with a real person. Really great real people. When we drove our daughter to SJU to start school in the fall, we were pretty sure we were leaving her in good hands. Our experience to that point indicated that SJU treated students as individuals, not numbers, and that personalized attention is their primary focus. We knew she had made the right decision when every administrator, staffer, and student leader said to us, "Thank you for entrusting us with your daughter." When we drove away that day, our tears mingled with our smiles. Our daughter was in her new home and a part of her new family. We felt truly blessed. St. Jerome's is now part of our family, too. Deciding whether or not to go to university for many young people, and their families, is a daunting task, and choosing the best university to apply to is perhaps even more laborious. As a parent of freshmen twins I can most certainly relate to this scenario; my days of perusing countless pamphlets and brochures, and attending numerous campus tours are not far from my mind. What also is not far from my mind is the epiphany, if you will, that took place during one such tour wherein we discovered that finding the “best” school to apply to may in fact have less to do with the prestige, accolades, and the plethora of programs, courses, and activities being professed by each institution, and more to do with finding the right fit for each of them. A hidden treasure nestled within the heart of the University of Waterloo, St. Jerome’s is a small tight-knit inclusive community that balances higher education with one-on-one individual attention, yet is large enough to encourage and facilitate exploration, opportunity, and personal growth. 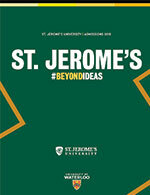 Simply stated, St. Jerome’s is the right fit because it offers the very best of both worlds: small enough to foster confidence and independence, where you’re not just another face in the crowd, but large enough to cultivate curiosity and establish a place in the greater global community. The personalized attention and welcoming spirit of the St. Jerome’s academic community is not merely restricted to students and staff, but has been extended to our entire family. Any and all questions and concerns have been promptly and personally addressed, and the support and advice from everyone from the campus recruiters to academic advisors have been beyond the call of duty – exceptional. Moreover, the Investiture Ceremony that took place in September was a wonderful expression of not only the St. Jerome’s rich tradition and their dedication to future endeavors and student success, but it was also an official welcoming of all students that included their families. The care and detail that went into both the ceremony and the luncheon reception are truly indicative of the commitment of faculty and staff to creating a superior environment to learn and mature in. This genuine sense of community and camaraderie solidified the fact that St. Jerome’s is much more than just another academic institution to peruse and consider – it is indeed the right fit – and one that my family is very proud to now belong to.